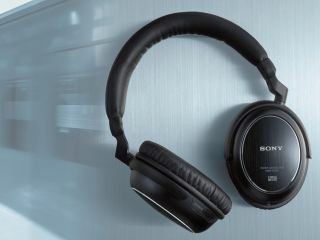 Sony 's over-ear headphones have been improved to offer clearer audio and almost-perfect noise cancelling. If you've ever used noise-cancelling headphones you don't need us to tell you that there's no way back - reverting to normal cans is just so, well, primitive. With that in mind, we're glad to report that Sony's decent noise-cancellers from 2005 have been upgraded and improved. The new JPY24,675 (£104) model, the MDR-NC60 , went on sale in Japan today after being previewed at the Consumer Electronics Show ( CES ) earlier this month. It improves upon its forerunner by combining the audio driver and the microphone that detects the external noise to be cancelled into one unit, which makes for a more accurate feedback system. It also uses better material in the soft ear pads for a tighter seal and clearer sound delivery and Sony has thoughtfully included a jack for plugging into airplane audio systems. The AAA battery that powers things will last for 30 hours and the noise-cancelling feature can be cancelled itself at the flick of a switch. Sony reckons the NC60 can cut out 85 per cent of ambient noise, making it perfect for avoiding piped muzak in the gym. Expect to see the new headphones outside Japan sometime during March.